An EPC report contains detailed information about energy usage and energy costings for the property, is also gives recommendations on how to reduce your energy costs and save money in the process. Pinnacle Property Services can arrange for EPC Reports to be carried out at your property. A certified Energy Assessors will attend your property and carry out a visual inspection, accompanied with a handful of photographs as evidence for the report. They will take note of the floor areas, heating system and controls, construction and insulation within the property, they require access to the loft areas to inspect the roof, and all damp proofing and draught excluders will be noted on. It can take anywhere up to an hour to complete the assessment dependant on the property size. An EPC provides an energy efficiency rating for your property, these range from Grade A-G. The rating is based on lighting, insulation, heating and construction. All EPC’s are produced within government guide lines. EPC Reports are split into two ratings, the first being the current efficiency level being maintained by your home, the second being the potential level, based on improving your energy efficiency measures.. 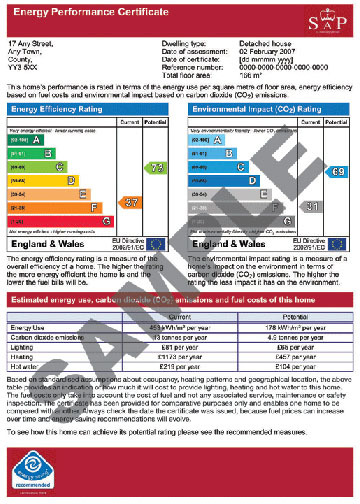 The EPC Reports are colour coded, from red, being the lowest level to dark green, being the highest rating. Epc reports should be available for tenants before adverts are displayed by state agents, these can usually be obtained online. It is a requirement of law that an EPC report is provided each time a property is brought, sold or rented. Pinnacle Property Services are in contact with many EPC Assessors throughout Kent and London and we can easily arrange this service on your behalf. It has been a requirement by law as of January 2013 that a landlord / letting agent has to provide the tenant with an up to date EPC report free of charge. It is in the interest of the tenant to use the government based EPC Advisor to make their home more energy efficient and cost effective.